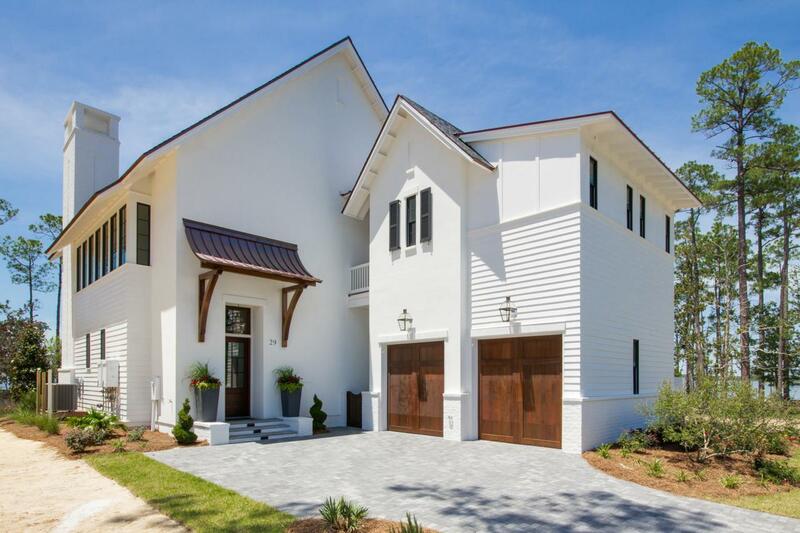 This stunning bay view home located in the Churchill Oaks neighborhood is designed by Savoie. The main residence offers 3 BA/3.5 BA, 2 car detached garage, and a 1 BR/1BA carriage house. This high end home has extraordinary finishes such as reclaimed hardwood flooring throughout, tongue-and-groove ceiling and brick accents throughout. Enjoy quiet evenings on the wide covered porch with gorgeous views of the Bay. The spacious first floor features an inviting living room centered around a white brick fireplace and grand dining room with a striking designer chandelier. The chef's kitchen faces the courtyard with beautiful quartzite counters, white shaker style cabinets,Wolf appliances including 48'' 6-burner range and Sub-Zero appliance including side-by-side refrigerator, and wine cooler. The luxurious master has a large walk in closet and expansive private porch with beautiful Bay views. A freestanding bathtub, massive shower, marble floors, quartz countertops and built-in cabinets make the master bathroom serene and functional. Tucked away with only native vegetation and the calm waters of Hogtown Bayou in sight, Churchill Oaks offers a lifestyle of elegance and appreciation of nature. Once inside the stately gated entrance, magnificent coastal homes accentuate southern architecture under a canopy of old oak trees. The 40-acre community is comprised of 87 homesites and some of the best amenities in South Walton. The Churchill Oaks Clubhouse is an outstanding 8,000 square foot amenity situated on a point on the Bay with stunning views. Three pools, exercise room, outdoor bar, fully equipped media room, commercial grade kitchen, bath and locker rooms, and large gathering spaces are all found at the Clubhouse for owners and their guests to enjoy. The latest amenity coming to the community in 2019 is a brand-new private marina. The marina project will include 36 private boat slips, paddle board storage decks, a fish cleaning station, shoreline stabilization + more! © 2019 Emerald Coast Association of Realtors MLS. All rights reserved. IDX information is provided exclusively for consumers' personal, non-commercial use and may not be used for any purpose other than to identify prospective properties consumers may be interested in purchasing. Information is deemed reliable but is not guaranteed accurate by the MLS or Classic Luxury Real Estate, LLC. Data last updated: 2019-04-26T08:59:24.287.